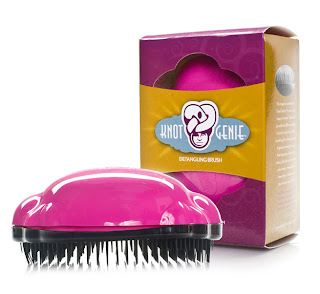 Knot Genie Detangling Brush only $10, Regularly $20! Today at So Lo La' Deals, you can get a Knot Genie for only $10. That's half off its regular price of $19.99! Plus, you'll get a $5 credit after your first So Lo La' Deals purchase to use on your next purchase! I bought one of these about a year ago, and I am totally serious when I say the Knot Genie is a miracle! I had heard of them before, but was a bit skeptical. When I saw them on sale for 50% off last Christmas though, I bought one. I got it for my daughter because as I'm sure most moms have experienced this, she threw a fit every time it was time to brush her hair. She has thick, very wavy hair and was always knotty when wet. Let me tell you, this brush does what it says 100%! I was actually shocked...it ran through her hair so easily and pulled the knots out, without pulling her hair...amazing!